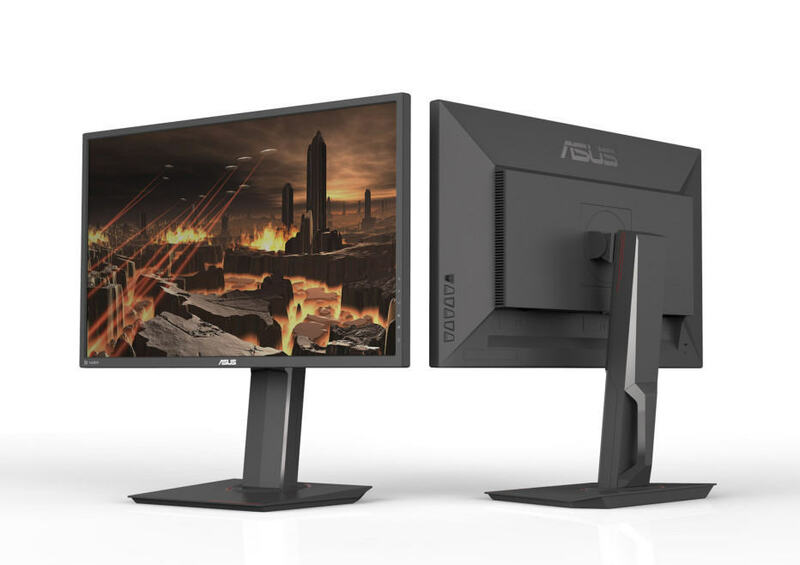 ASUS has introduced a new monitor aimed at entry-level gamers. With a 21.5-inch Full HD screen and a TN panel, the ASUS VP228QG is certainly not a kind of monitor you want to be getting in 2018. Especially now when you can get a nice 24-inch 1080p monitor with an IPS panel for around $130. The ASUS VP228QG does offer some extra features that many similar budget displays lack, but it will need more than that to attract potential buyers – something like a really affordable price tag. What distinguishes the ASUS VP228QG from the rest of the ~22-inch affordable monitors is its support for the AMD FreeSync technology as well as the included DisplayPort which is usually found in more advanced displays. 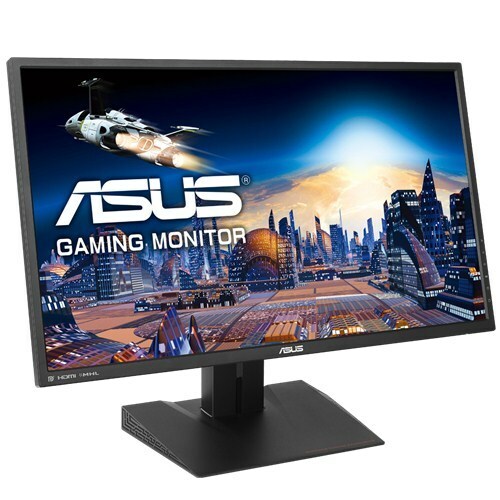 As a TN panel monitor, the ASUS VP228QG provides a very basic image quality with a 250-nit peak brightness, 16.7 million colors (6-bit + FRC), and the standard 1.000:1 static contrast ratio. The viewing angles are 170° horizontally and 160° vertically, so the picture will shift in contrast and color if it’s viewed from skewed angles. However, ASUS offers an exclusive feature called Smart View which can improve the viewing angles by altering gamma and brightness. Unlike some older budget TN panel monitors, the ASUS VP228QG has the fastest response time speed of only 1ms, enough to eliminate motion blur and ghosting in the fast-paced video games. 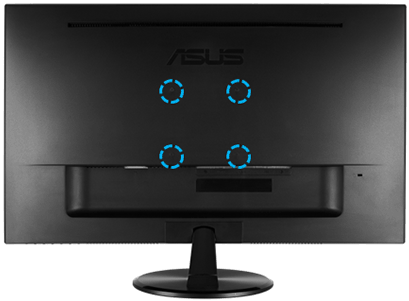 Furthermore, the monitor offers the AMD FreeSync technology which will allow those with AMD FreeSync-compatible graphics cards to synchronize the frame rate of the GPU to the monitor’s refresh rate. By doing so, you will get rid of all screen tearing and stuttering within the dynamic refresh rate range of 48-75Hz/FPS (Frames Per Second). The ASUS VP228QG FreeSync monitor will also provide you with all the game-enhancing feature usually found in the more modern displays. The ASUS GamePlus feature consists of customizable on-screen crosshairs, timers, and an FPS counter. Moreover, you will have access to numerous pre-calibrated picture presets you can use depending on the type of content you’re watching. If you’re often formatting documents and images, the Virtual QuickFit Scale feature will allow you to place a grid on the screen with several different formats. The VividPixel feature can sharpen the low-resolution picture to look more detailed, but remember to disable this feature when it’s not needed as it can make regular content look over-sharpened. Like all modern displays, the ASUS VP228QG monitor does not use PWM (Pulse Width Modulation) to regulate brightness and is thus flicker-free. It also has a built-in low blue light filter as well as an anti-glare coating for a comfortable viewing experience even after prolonged use. The design of the monitor is quite basic with somewhat thick bezels and a rather outmoded stand. There are 100 x 100 holes for the VESA mount, but the monitor is tilt-only by -5°, 20°. 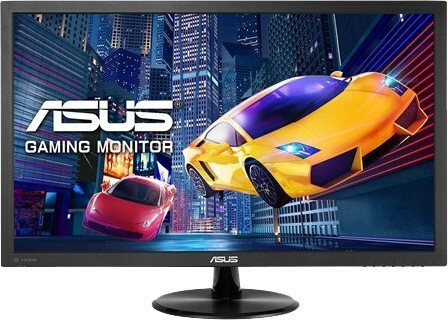 The ASUS VP228QG is one of the rare budget monitors to feature the DisplayPort; It also offers an HDMI and a VGA port as well as the headphones jack and an audio line-in for the two 1.5W integrated stereo speakers. 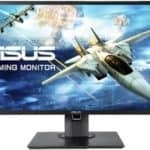 Release date and the price of the ASUS VP228QG are unknown at the moment (April 2018) but we believe the monitor shouldn’t cost more than $100. If you’re looking for a budget 21.5-inch monitor, check out the popular HP 22cwa costing only $90. It may not have AMD FreeSync but it does have an IPS panel which will give you a significantly better image quality.